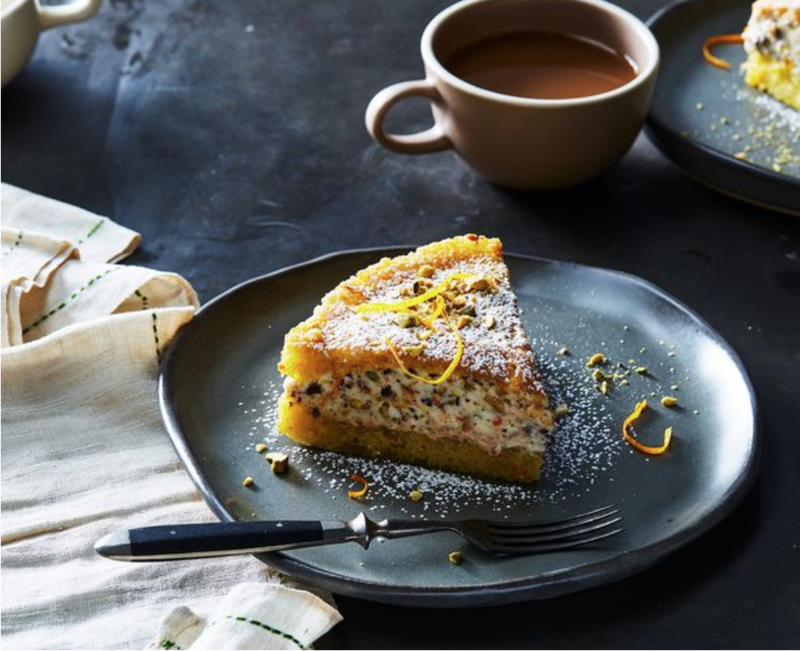 A celebration of good olive oil - This fragrant olive oil sponge cake made with rice flour -which enhances the flavor of the oil— is split and moistened with more oil and filled with vanilla crème fraîche laced with chopped chocolate, pistachios, and candied orange peel. Drizzle the plates with oil just before serving as well. If you are fortunate enough to have a bottle of olio nuovo—unfiltered fresh oil from the most recent harvest, you can save it for drizzling, use extra virgin oil in the batter. Or go nuts and use the new oil throughout. A note on rice flour: Use an American brand of regular or superfine rice flour. The Thai rice flour available in most Asian groceries is too fine and will not work with this recipe. To make the cake: Preheat the oven to 350° F with a rack in the lower third. Measure all of the cake ingredients before you begin, and have a sieve or sifter at hand. Mix the softened butter with the teaspoons of sugar and smear it over the sides (only) of and 8 by 2 inch round cake pan. Pour the pistachios in the pan and rotate it like a ferris wheel to coat the sides with nuts. Save excess nuts for the filling. Line the bottom of the pan with a circle of parchment paper. Put the olive oil in a 4 to 6-cup bowl (it must be large enough to fold some of the batter into later). Grate the zest of half of the orange over the oil, and set the orange aside—you'll zest the other half later. Put the sugar, eggs, and salt in the bowl of a mixer fitted with the whisk attachment. Whip the on high speed for 3 to 4 minutes, or until the mixture is tripled in volume and forms a slowly dissolving ribbon when the beater is lifted. Whisk the rice flour to fluff it. Sift one-third of the flour over the eggs. Fold until the flour in almost blended. Repeat with half of the remaining flour. Repeat with the rest of the flour, folding until the flour is blended. Scrape about one quarter of the batter into the bowl of olive oil. Fold until the oil is completely blended into the batter. (You will be tempted to stir instead of fold—but keep on folding until the batter absorbs the oil). Scrape the oiled batter over the remaining batter and fold just until blended. Scrape the batter into the prepared pan. Bake 25 to 30 minutes, until the cake is golden brown and just beginning to shrink from the sides of the pan. Cool the cake in the pan on a rack. Slide a slim spatula around the sides of the cake, pressing against the sides of the pan to avoid tearing the cake and unmold it onto a rack, peel off the parchment and turn the cake right side up to finish cooling. To fill and finish the cake: Whip the crème fraîche with the vanilla and sugar until it holds a nice shape but is not completely stiff. Fold in the diced peel, remaining pistachios, and chopped chocolate. Use a serrated knife to cut the cake in half horizontally. Set the top piece aside. Drizzle the cut side of the bottom layer with 1 tablespoon of oil. Spread all of the filling evenly over the layer. Drizzle the cut side of the top layer with 1 tablespoons of oil and set it, oiled-side-down, on the filling. Press the layers gently to level the cake. Wrap and refrigerate the cake for at least an hour and up to a day. Remove the cake from the fridge 30 minutes before serving. Sieve a little powdered sugar over the cake, sprinkle with reserved pistachios and long thin shreds of orange zest stripped from the unzested half of the orange.